Are you or someone you know enthusiastic about the art of photography? Here’s a wonderful gift for those who have a DSLR and want to take control of their camera using Manual settings. The focus of this workshop will be the subject of their passion.. i.e. Architecture, Food, Product, Portraiture, Nature, Street, Landscape, or Night Photography. This three-part workshop includes classroom, hands-on and outdoor demonstrations. You will receive a gift certificate to give your loved ones with email confirmation to print or mailed to you. Details: One on one workshop focusing on taking control of their Photography. The workshop will be catered with emphasis on the type of photography they are interested in such as (Architecture, Food, Product, Portraiture, Nature, Street, Landscape, or Night Photography) workshop includes hands-on, and outdoor demonstrations of up to three hours. What they will learn: Take control of their camera and make the viewer the prelude to their canvas with discussions about: Photography fundamentals + Principles of Design in photography + Camera functions and controls + Manual Mode vs. Automatic mode + Lenses + Lighting + Exposure + Aperture +Shutter speed + Composition + and much more! 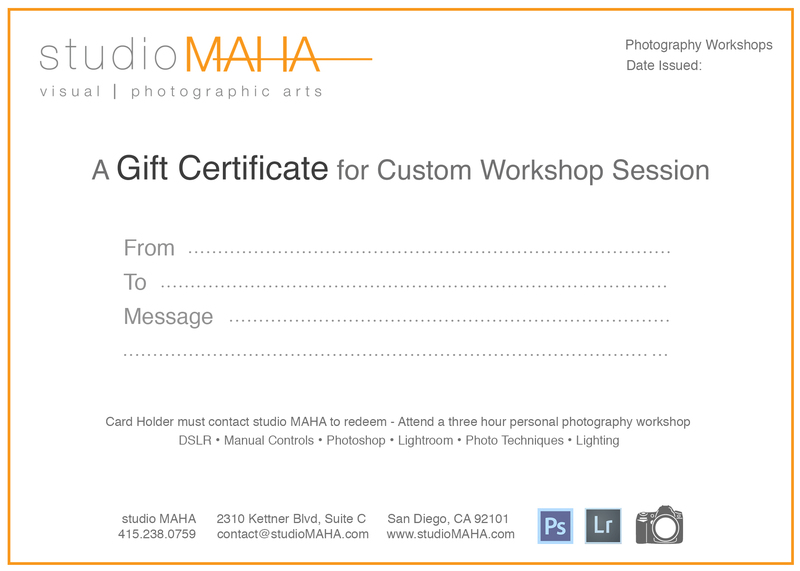 Email or Call studio MAHA at 415.238.0759 to purchase your certificate today.